When her mother died and father fell into debt, Nimira set off for the big city, hoping to make her fortune as a dancer. She is just managing to get by when the sorcerer Hollin Parry appears and makes her an offer she finds difficult to refuse: to work for him, singing with a fairy-made, life-size automaton. Nimira's new life is better than she could believe, but when she discovers that a fairy named Erris is actually trapped within the automaton, her life is put in grave danger as she is ensnared with a tangled web of lies and secrets that could threaten the peace between two races. Magic Under Glass is a sparkling and intriguing read. Nim is a lively and spunky heroine who is smart, charming, and resourceful, and Dolamore's fantastical world is brimming with magic and adventure. There are a few different cultures within the pages of Magic Under Glass, and Dolamore portrays them and their differences very well. It would be interesting to explore that aspect of the story a little more, which Dolamore will hopefully do in a sequel. The characters were quite varied: from intelligent but imprisoned Erris, imposing Hollin Parry with his many secrets, a formidable housekeeper, and a mysterious madwoman. They, along with whispered secrets and murderous plots and villains, make the novel quite entertaining, and keep the book moving briskly. Magic Under Glass is a wonderful example of lovely, spirited storytelling, and an all around fun and lightly romantic fantasy read. Cover Comments: This cover is lovely and magical and fills you with breathless anticipation--simply perfect. I love the font, the pose of the model, the hints of magic, everything! I think what most got me intested in this book was the different types of cultures incorporated. 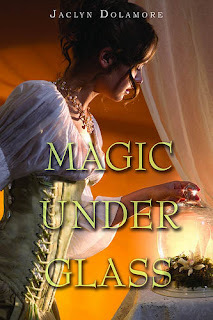 It sounds like Magic Under Glass will be a really fun read and the cover looks beautiful! Thanks for the review! While I do love the cover for Magic Under Glass, it is actually inaccurate because Nim isn't white. Contest: Win the Soul Screamers Books! Cover Talk: Old Magic Gets a New Look! Sing Me to Sleep Trailer! Lonely Hearts Club Twitter Party! Blog Talk Radio and Me! Meet the Cast of Percy Jackson! Fun With Alexandra Bullen and WISH! Do You Have an Awesome Dream? Why Does It Always Come Down to the Booze? Interview with Melissa de la Cruz! New Year, New ARCs Contest!